Chicka-dee-dee-dee! Chicka-dee-dee-dee! That is one of the many calls that both of these chickadees make. The first time I saw a chickadee was in the state of West Virginia in the mountains. I was on a camping trip with my husband, his mother (Janet), and her friends. Janet loved her birds and was excited to show me a nest of chickadees that she had come across. That was a definitely a great find. Not only did I get to see my first chickadee but babies too! That was the start of my love for chickadees. Such cute little birds! I’m thinking that it could have been a Black-capped Chickadee as they are found in higher elevations in West Virginia, however it could also have been a Carolina Chickadee. I was not in to bird watching at that time and didn’t pay much attention to any detail on the bird nor the elevation where we were. 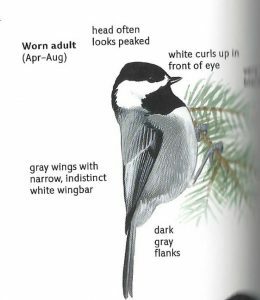 You see the Black-capped Chickadee can be found in higher elevations of the Appalachian Mountains which was where we were, coast to coast in the Northern United States, and throughout Canada. 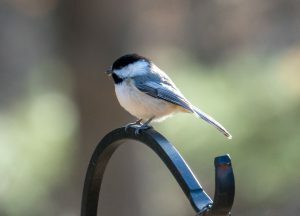 The Black-capped Chickadee is slightly larger than the Carolina, at 5.25 inches in length with a brighter white line on its cheek and neck, a slightly darker back and with more white on its wings. 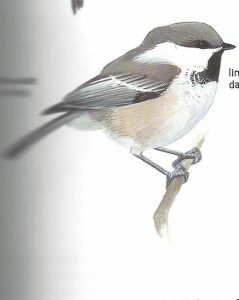 Its call “chick-a-dee-dee-dee!” is a lower and deeper sound as compared to the Carolina Chickadee. This is a more widespread and common bird found in mixed and deciduous woods, along forest edges, in the suburbs, and parks. It feeds on insects, berries, and has no problem coming in to bird feeders with sunflower seeds or suet. 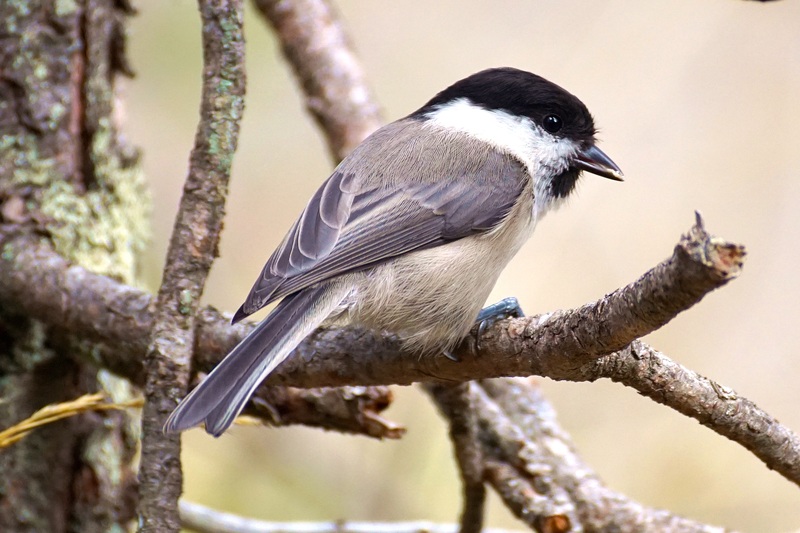 Black-capped Chickadees breed in spring using nesting cavities such as in a tree and also in nesting boxes. The Carolina Chickadee is 4.75 inches in length and is somewhat duller in its coloring. As compared to the Black-capped the white at its cheek and neck is more grey in color and it has a lighter back than the Black-capped. It has a smaller head and shorter tail too. This bird’s “chick-a-dee-dee-dee!” call is a higher pitch and faster than the Black-capped. Carolina Chickadees can also be found in mixed and deciduous woods, along forest edges, parks, and suburbs. It feeds mostly on insects during the summer months and seeds and berries in winter. It will come easily to your bird feeders that have black-oiler sunflower seeds, and also to your suet feeders. I also get them at my thistle/nyger feeders especially in winter. This bird also breeds in spring and uses nesting cavities in trees as well as uses nesting boxes. 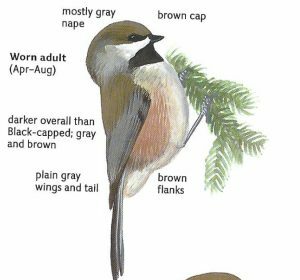 Boreal Chickadee – they are found much further north closer to the Canada border in remote areas mainly in conifer forests. It feeds on insects and seeds. 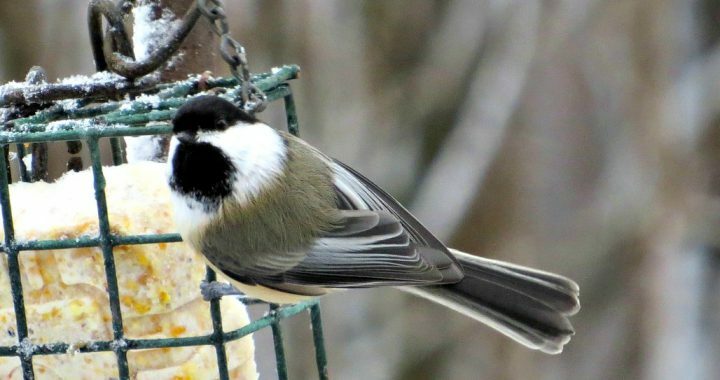 This chickadee is from 4.9 inches to 5.7 inches in length. (Photo taken from Guide to Sibley Birds Second Edition). 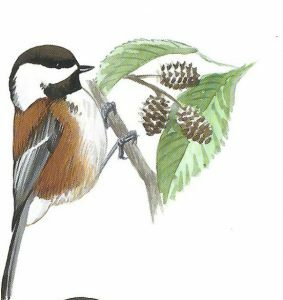 Chestnut-backed Chickadee – found along the West Coast and the Pacific Northwest. It is 4.5 to 4.9 inches in length. Its habitat is mixed coniferous forests eating insects and seeds. (Photo taken from Guide to Sibley Birds Second Edition). Gray-headed Chickadee – this bird is a more rare chickadee that lives in remote areas of Alaska and in northwest Canada. About 5 inches in length and found in coniferous forests. (Photo taken from Guide to Sibley Birds Second Edition). Mountain Chickadee – found in higher ranges of mountains in the western part of North America. It feeds mostly on insects, seeds, and berries in coniferous forests. It is about five to six inches in length. My husband captured this photo in Estes Park, Colorado. Mexican Chickadee – the Mexican Chickadee is found mostly in the mountain forests of Mexico and also in the Chiricahua Mountains of Arizona. This little chickadee is about five inches in length and found in coniferous forests. It feeds mostly on insects and some seeds. (Photo taken from Guide to Sibley Birds Second Edition). 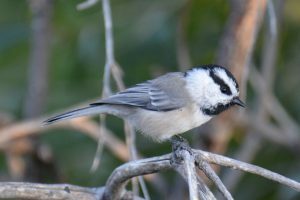 The Carolina Chickadee and Black-capped Chickadee are pretty similar in appearance and sometimes may be mistaken for one another. This is especially if you are on the border of their specific ranges where the two may overlap. The two birds do not generally go out of their ranges otherwise so you will know which one it is depending on your location. 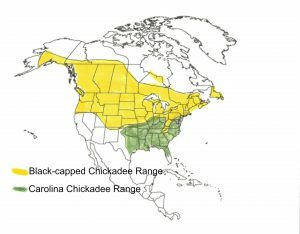 The Black-capped Chickadee will be found from coast to coast in the northern parts and also in higher elevations of the Appalachian Mountains and the Carolina Chickadee only found in the south eastern half of the United States and as far west as Oklahoma. In either case, seeing one of those cute little black and white birds and hearing their “chick-a-dee-dee-dee!” call is always a delight for sure. Posted in Backyard Birds, Songbirds and tagged black capped chickadee, carolina chickadee, chickadee.